The Center on Health Services Training and Research (CoHSTAR) was established with a Foundation grant of $2.5 million. Funding for this initiative was made possible with a $1 million gift from the American Physical Therapy Association (APTA), gifts from 50 APTA components, and donations from physical therapists, foundations, and corporations with a shared passion for the field of physical therapy. CoHSTAR’s mission is to train physical therapists to conduct health services and health policy research and to expand the number of physical therapists who specialize in this research. 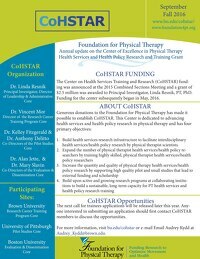 CoHSTAR strives to increase physical therapy health services research capacity. The five-year, multi-institutional research and training program is training physical therapist scientists in order to dramatically increase and improve physical therapy health services research capacity, continuing to help make the practice an integral part of today’s health care discussion and mainstream medicine. CoHSTAR offers postdoctoral fellowships, hosts visiting scientists, and provides special summer training sessions. Each trainee is paired with a highly experienced mentoring team from one or more of the institutions, participates in immersive research experiences, and has access to other training activities and courses from 26 pertinent graduate programs at three institutions — Brown University, the University of Pittsburgh, and Boston University. Additionally, CoHSTAR will fund several high-quality promising pilot studies each year from investigators within and outside the Center. Health services research (HSR), also known as health systems or health policy research, looks at how people access healthcare services and providers, costs of care, and outcomes of care. HSR studies aim to find the most effective, efficient, safe and accessible ways to deliver patient care. Why is health services research important to physical therapy? CoHSTAR was established by the Foundation for Physical Therapy to promote HSR to ensure that we will be better prepared to address critical issues facing our profession and the health care system. Government agencies, lawmakers, payers, providers, and consumers rely on HSR to make important decisions. HSR impacts the healthcare landscape by enabling providers and patients to make better decisions about health care, leading to improvements in the health of our society. HSR informs decisions regarding payment policy and health care coverage, aiding in the improvement of health care delivery. Ultimately, HSR can be used to demonstrate the value of physical therapy and identify optimal strategies for the delivery of care. What is the history of this initiative? Validating the necessity and cost-effectiveness of physical therapy has been an ongoing need in physical therapy research. The community was particularly inspired after the 43rd Mary McMillan Lecture, “Face into the Storm,” which was presented to attendees at the NEXT Conference & Exposition in 2012. Alan M. Jette, PT, MPH, PhD, FAPTA, called on members of the profession to take a front-seat role and become proactive in devising, implementing, and evaluating health policy and cost-effective healthcare. The Foundation, driven by the vision of the Board of Trustees and supported by generous donors like APTA, conducted an unprecedented campaign to raise funds for health services research and training. In December of 2014, the Foundation officially awarded $2.5 million — our largest research grant to date — to establish CoHSTAR. What is the structure of CoHSTAR? CoHSTAR is directed by a Leadership and Administrative Core (LAC) and guided by an External Advisory Board. CoHSTAR includes a Research Career Training Program Core (RCTPC), a Pilot Studies Core (PSC), and an Evaluation and Dissemination Core (EDC). The LAC is based at Brown University School of Public Health and housed within the Center for Gerontology and Health Care Research. Dr. Resnik serves as principal investigator and LAC director. The 6-person CoHSTAR External Advisory Board assists in strategic planning, prioritizing focus areas for pilot study funding and recruitment of trainees. The RCTPC is led by Vincent Mor, PhD at Brown University. The aim of the RCTPC is to provide training for postdoctoral trainees and visiting scientists in health services research for physical therapists that will guide their career development as health services researchers. Kelley Fitzgerald, PT, PhD and Anthony Delitto, PT, PhD at the University of Pittsburgh are leading the PSC. The aims of the PSC are to solicit pilot study applications relevant to physical therapy, select outstanding pilot projects for funding, provide oversight/data safety and quality monitoring of ongoing pilot projects, help investigators translate pilot projects into full scale research grant applications for extramural funding, and monitor the progress and success of the PSC. The EDC is led by Alan Jette, PT, PhD, and Mary Slavin, PT, PhD at Boston University. The aims of the EDC are to develop and implement a comprehensive evaluation framework to assess CoHSTAR activities, communicate with core directors and coordinate improvement activities as needed, ensure that program information is optimally disseminated to target audiences, and enhance the impact and sustainability of CoHSTAR activities. The Visiting Scientist Program offers health services researchers an opportunity for in-depth collaboration with our experienced research team. CoHSTAR provides visiting scientists hands-on experience working on-site with investigators at one of the three collaborating institutions (Brown University, University of Pittsburgh, & Boston University). Learn more about visiting scientists. Announcing a new full-time Postdoctoral fellowship. CoHSTAR is offering a new post-doctoral fellowship funded jointly with the COMPASS (Comprehensive Post-Acute Stroke Services) Trial. The fellowship position is for 2 years, beginning January 2019, and will be located at the University of Pittsburgh. The fellow will be provided with didactic training, travel support, information resources, and secretarial or technical support. The fellow will receive health benefits, vacation days and sick days. Learn more about CoHSTAR fellowships. implementation science and quality assurance research. Read more about current pilot projects, or see information regarding a pilot study application. 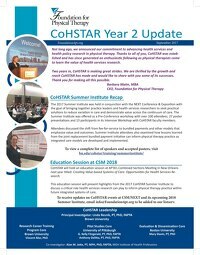 The most recent CoHSTAR Summer Institute — Creating Integrated Systems of Care: Promise and Pitfalls — was held on June 21, 2017. Learn more about CoHSTAR conferences. 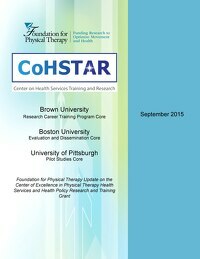 The Foundation for Physical Therapy Research-funded Center on Health Services Training and Research (CoHSTAR) is holding its health services research institute on May 1-2 in Providence, RI. This fourth Institute will focus on the emerging discipline of implementation science and provide opportunities for researchers and clinical leaders to develop strategies to improve the quality and effectiveness of rehabilitative care.